Even recognizing that it's among the most unnecessary sequels ever made and that it exists purely because of how much money the original Mamma Mia made ($144M domestic, $610M worldwide), it's difficult to hate Mamma Mia: Here We Go Again. It's tough to complain about an unfocused story because the same criticism could be leveled against the first film - that's what happens when a story is constructed around a bunch of popular songs that were written decades ago for entirely different purposes. Mamma Mia: Here We Go Again is more of the same. One senses viewers wouldn't want anything different. 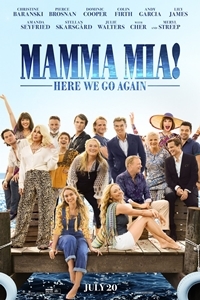 One problem faced by the filmmakers (with director Ol Parker replacing Phyllida Lloyd) is that nearly all of ABBA's "A-list" songs were used in Mamma Mia. While the group has an impressively large catalogue, audience appreciation is going to differ between something that gets Oldies radio play today and something that most people haven't heard since the '70s (if ever). Consequently, the majority of Here We Go Again's soundtrack is comprised of songs from two categories: "B-list" tunes that will be familiar only to die-hard ABBA fans and repeats of songs from Mamma Mia. There are more of the latter than the former. Also included are the two hits that didn't make it into the first film: "Waterloo" (which was shoehorned into the end credit fantasy sequence) and "Fernando." Mamma Mia began life as stage musical, traveling around the world and playing to sold-out audiences on Broadway for many months before the movie arrived. Here We Go Again is a straight-to-screen production. Most of the cast has returned with one notable exception: Meryl Streep. While Streep didn't completely abandon the production (she has a cameo that took a few days to film), the character of Donna is dead when the movie begins and appears only in flashbacks, where she's played by another actress (Lily James). One has to wonder whether this is a case of the tail wagging the dog. Was the decision to kill off Donna because Streep wanted to limit her participation? That seems at least possible because it results in a weirdly bittersweet tone where the sometimes-funereal atmosphere clashes with the kitschy pop of the ABBA tunes. Because there's not sufficient story in the present time frame to fill up the two-hour running length, the movie resorts to telling the entire tale of how Donna became pregnant with Sophie. These extended flashbacks take us 25 years into the past and introduce a new group of actors playing younger versions of the familiar characters. In the "present" time-frame, Sophie (Amanda Seyfried), is preparing to re-open the Greek island restaurant founded by her mother, who died a year ago. She is joined in the endeavor by her mother's lover, Sam (Pierce Brosnan), who has lived on the island since reuniting with his lost love in the first film. Also on hand is Fernando (Andy Garcia), the ultra-polite gentleman hired to manage the restaurant. Missing in action are Sophie's other two fathers, Harry (Colin Firth) and Bill (Skellan Skarsgard); her husband, Sky (Dominic Cooper); and her grandmother, Ruby (Cher). Making the trip for the festivities are Donna's best pals and bandmates, Tanya (the scene-stealing Christine Baranski) and Rosie (the equally scene-stealing Julie Walters). Meanwhile, in the past, we see how a younger Donna leaves behind Tanya (Jessica Keenan Wynn) and Rosie (Alexa Davies) and heads out to see the world, ending up in Greece. On the way there, she has a brief tryst with Harry (Hugh Skinner) before embarking on a wild affair with Sam (Jeremy Irvine). After that ends poorly, she has a fling with Bill (Josh Dylan), who owns a boat with a bed that comfortably sleeps two. No, it's not Shakespeare, but what do you expect? The whole point of the movie is to present a music video for a large collection of ABBA tunes as covered by legitimate actors, not all of whom can sing. There's nothing wrong with that except that it has already been done and mostly with the same songs. To give the filmmakers their due, they did an excellent job of casting the younger versions of the familiar characters. All resemble their older selves and exhibit the same mannerisms. (This is something Lucasfilm should have considered when re-casting Han Solo.) At least the pointlessness of the flashbacks is limited by not having a disconnect between the younger and older versions of the characters. An unusually footloose and fancy-free Lily James is as good here as Donna as Meryl Streep was in the first film. The two versions of the cast don't meet until the end credits where fantasy takes over for "reality." As for the ABBA songs, there's a sense of going to the well too many times. This movie's version of "Dancing Queen" may be the only number that's done better in the sequel than in the first film; most of the others feel obligatory and there are about ten regurgitations. Of the "new" songs, only "Fernando" stands out, and that may because of the novelty of having Cher, with her distinctive voice, singing an ABBA song. Those who hated Mamma Mia may become dangerously unstable if forced to sit through the sequel. Fans of the first movie will find that a lot of the magic is gone and everything loses some of its luster the second time around. As for the majority of the movie-going community, which exists between those two camps, there's no cogent reason to see Here We Go Again. The first movie does a better job of everything this one does rendering the second installment redundant - painless but purposeless.